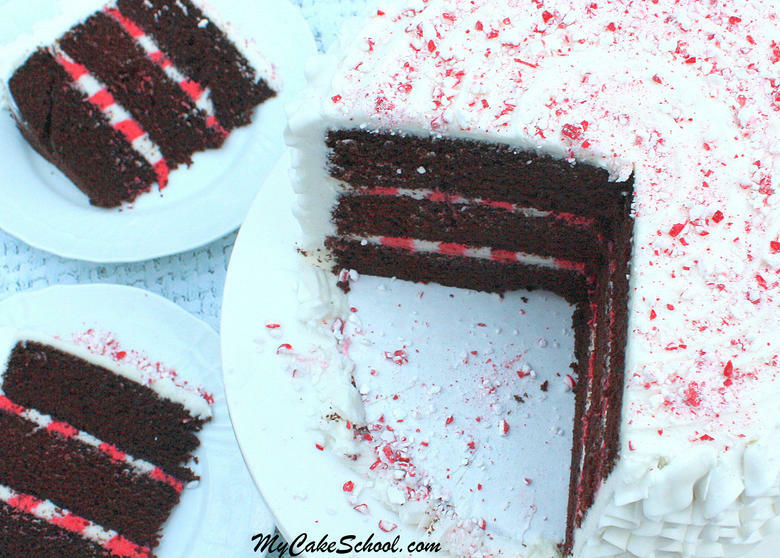 This delicious and simple Peppermint Buttercream Recipe is heavenly! If you love peppermint like I do, you’re going to want to hang on to this recipe! When making mint chocolate chip cupcakes, I like to fill my piping bag with the Peppermint Buttercream, and using a tip 10 or 12, insert it into the unfrosted cupcake and give it a quick squeeze to give it a small mint frosting center. Then swirl the tops as usual. SO good! You can also use this Peppermint Buttercream recipe for Mint Chocolate Chip filling by stirring in mini chocolate chips. I’ve made quite a few Mint Chocolate Chip Cakes and they are always a hit! Finally, if you want to find out how to make the pretty candy cane striped filling that is pictured below, visit our free quick and easy tutorial for our Chocolate Candy Cane Cake! I love the stripes! Cream the softened butter. Add half of the powdered sugar, the peppermint extract and one half of the milk. Begin mixing on low speed increasing to medium speed for 2 to 3 minutes. Add remaining powdered sugar. Add the remaining milk gradually, determining how much you need for the right consistency. Mix at low to medium speed another 3 to 4 minutes scraping the sides of the bowl occasionally. Slow down the mixer to very slow (#2 speed on the KitchenAid) for the last 1 to 2 minutes. This will help eliminate air pockets in the buttercream. The texture will become very smooth. Can be frozen in air tight container for at least three months. Thaw on countertop. This is a crusting buttercream and works well with the Viva Paper towel smoothing method. However high humidity may make it less like to crust, in which case you can use the hot knife method for smoothing.